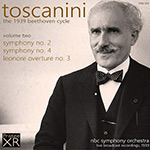 On 28 October 1939, Arturo Toscanini took to the podium with his NBC Symphony Orchestra to begin what would be a unique series of six concerts: his only recorded Beethoven integral symphony cycle. Over six weekly concert broadcasts Toscanini would conduct all nine symphonies, roughly in order, together with various overtures, excerpts and other works, most interestingly the Choral Fantasy, Op. 80. This was coupled with the Ninth "Choral" Symphony in a special broadcast live from Carnegie Hall (the other concerts took place in his more usual radio studio venue), and constitutes the only recorded example of him conducting this work ever. Mortimer H. Frank suggests that Toscanini considered conducting the work again in 1952 in London but dropped the idea - he also suggests this may have been the only time Toscanini ever conducted the Choral Fantasy. As with our recent issues of Toscanini conducting Russian music (PASC548) and the music of Richard Strauss (PASC549), I have been able to access source recordings of unprecedented quality, taken from acetate discs recorded directly by NBC and almost certainly not played since. For optimal sound quality this is crucial - the delicate surfaces of these discs are prone to immediate deterioration when played, especially when the weighty pick-ups in common use in the 1940s were used, resulting in distortion, higher background noise, and potential loss of high frequencies and other details. Previous issues have relied on Toscanini's own copies, discs which have seen considerable wear and use over the years. The use of these new source discs translates directly into remarkable audio quality, with quiet backgrounds and a particularly wide frequency range - and sound quality that would have been considered excellent on a hi-fi era LP record from twenty or more years later. The use of the latest audio restoration technology brings with it rock-solid pitching, excellent tonal balance, and a clean, clear sound quality throughout. This second concert contained more music than any of the others in the series - only by cutting all commentary and with judicious use of fades during audience applause and trimming of gaps between movements have we been able to fit the entire concert onto a single CD. And if some sides were perhaps less than optimal sonically, they still shine through after restoration, with excellent sound quality throughout as heard in our sample here of the finale from the Symphony No. 4. Certainly this concert has never sounded as fresh and fine as this before. There is no end to the marvel of music as familiar as Beethoven’s Second and Fourth Symphonies and the third “Leonore” overture, which Mr. Toscanini performed for the second program of the Beethoven series he gave with the NBC Symphony Orchestra last night in Radio City. How can any music, so well known, so endlessly played, keep its extraordinary significance? The reason, of course, lay in the wholly exceptional performance, which, whether or not the listener agreed with their every aspect, were fully abreast of Mr. Toscanini’s customary standards of tonal beauty, meticulous finish, grace and power; and, on occasion, the passionate torrent of Beethoven's feeling, which sweeps everything before it. The Second Symphony is the one which Camille Bellaigue terms so appropriately the “heroic lie.” The “lie” consists in the buoyancy and glow of the music that the master produced at the very time when he discovered that he was doomed to complete deafness, and when he penned one of the most pathetic of human documents, his so-called “Heiligenstadt testament” which is a martyr’s farewell to happiness. We know how unqualifiedly the symphony controverts all this, how bold and exultant it is in its irresistible spirit and its every idea and detail. For it flashes like a sword. The introduction in itself is a revelation, as the orchestra gradually brightens and gathers strength and effulgency. A valley in the morning would gradually lighten like that with the sunrise. But this is not the time to dilate upon all the wonders of the Second symphony. The performance of the first two movements was as ideal as we may hope a human performance to be. It was good to hear the pace at which Mr. Toscanini took the “larghetto,” which was flowing and joyous, and permitted of no slackening or sentimentalizing of the song. But we found the scherzo more conspicuous for its delicacy and eighteenth-century preciseness than for the brusque and shaggy Beethoven that inhabits these pages. Similarly in the finale, which is jocose, unbuttoned, sometimes sly, sometimes uproarious in its humor. A somewhat polite Beethoven was heard in the scherzo and the finale. The playing of the Fourth symphony was as remarkable for its transparency of tone in certain places as it was for that mysterious hush and brooding of the orchestra which is often felt when Beethoven writes in a pastoral vein—and surely this Fourth symphony, as well as the Sixth, is a "pastoral”! In none of the nine symphonies is there a greater sensation of mysterious nature than in the introduction and the slow movement. In general, of all the nine, it comes nearer to Haydn, for it has his vivacity in the livelier pages, and his full-hearted acceptance of living. The Fourth symphony is less vigorous and brilliant than No. 2. and was therefore the better foil for the thunders and prophecies of the overture ‘'Leonore, No. 3,” given a wildly dramatic performance.